The Republicans haven’t taken over yet but they’ve made their plans known and it won’t come as much of a surprise that their top priorities are tax cuts. One of the very first changes will be gaming the system that tracks whether or not tax cuts work. By every legitimate measure, including common sense, they don’t. The Pubs are going to change all that. AS Republicans take control of Congress this month, at the top of their to-do list is changing how the government measures the impact of tax cuts on federal revenue: namely, to switch from so-called static scoring to “dynamic” scoring. While seemingly arcane, the change could have significant, negative consequences for enacting sustainable, long-term fiscal policies. Whenever new tax legislation is proposed, the nonpartisanCongressional Budget Office “scores” it, to estimate whether the bill would raise more or less revenue than existing law would. [The] conventional estimates do not, however, include any indirect feedback effects that tax law changes might have on overall national income. In other words, they do not incorporate macroeconomic behavioral changes. Dynamic scoring does. Proponents point out, correctly, that if a tax proposal is large enough, then those sorts of feedback effects can aim the entire economy on a slightly different path. “Dynamic scoring” basically allows the injection of unjustified assumptions about the future performance of the economy. IOW, adding a baseline article of faith from Reaganomics that all tax cuts on the wealthy raise revenues and if they don’t, it’s because they weren’t deep enough. Federal deficits are on an unsustainable path (as it happens, because of undertaxation, not excessive spending). Simply cutting taxes against the headwind of structural deficits leads to lower growth, as government borrowing soaks up an ever-increasing share of savings. The most optimistic dynamic models get around this by assuming that the world today is in fiscal equilibrium, where the deficit does not grow continuously as a percentage of gross domestic product. But that’s not true. If you add the reality of spiraling deficits into those models, they don’t work. Again IOW, they’re going to enshrine in law a faith-based assessment mechanism guaranteed in advance to justify both their rosy predictions and their brutal get-tough-on-the-poor cuts to human services along with their go-easy-on-corporations cuts to everything from the SEC to the FDA. They will now be able to point to government-authorized conclusions that everything is fine even as it collapses around ordinary folk not rich enough to protect themselves from it. The Republicans’ interest in dynamic scoring is not the result of a million-economist march on Washington; it comes from political factions convinced that tax cuts are the panacea for all economic ills. They will use dynamic scoring to justify a tax cut that, under conventional scorekeeping, loses revenue. When revenues do in fact decline and deficits rise, those same proponents will push for steep cuts in government insurance or investment programs, because they will claim that the models demand it. That is what lies inside the Trojan horse of dynamic scoring. A win-win. When their tax cuts make the economy worse, their scoring model will demand more tax cuts as a fix. Priority #2 is likewise financially related: further weakening if not killing outright Dodd-Frank, once again allowing banks to rig their own scams. The Dodd-Frank financial reform law was supposed to curb speculation in swaps. But as The Journal has reported, hedge funds are increasingly using swaps to wager on whether weak firms will live or die. RadioShack, the troubled consumer electronics retailer, is one of several prominent examples. In December, RadioShack’s total debt came to about $1.4 billion, but swaps outstanding on the performance of the debt totaled $23.5 billion. Similarly, J.C. Penney, the ailing department store chain, had total debt of some $8.7 billion, but swaps outstanding on the debt totaled $19.3 billion. Those gaps suggest excessive speculation, though it is hard, if not impossible, to gauge the precise exposure of funds to big losses. What is known is that a hedge fund that is betting on a company’s default has an incentive to push it over the edge. Conversely, a fund that is betting a troubled company will not default has an incentive to keep it afloat, at least long enough to avoid a big payout. Either way, the company becomes a pawn in a financial game. Speculative activity is likely to increase. Last month, Congress repealed an anti-speculation provision of Dodd-Frank that would have prevented federally insured banks from conducting several types of swap transactions. 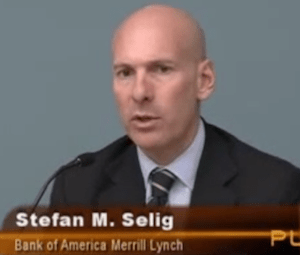 In addition, the Federal Reserve recently gave the banks two extra years to meet a Dodd-Frank provision requiring them to sell their investments in private equity funds and hedge funds. And when the 2 yrs are up, the Fed will extend the deadline for 2 more yrs and then 2 more after that and so on and so on. The Democrat minority will, of course, “compromise” by unconditionally surrendering when their corporate sponsors tell them to. Which is bad news, right? Wrong! Look at that other box. 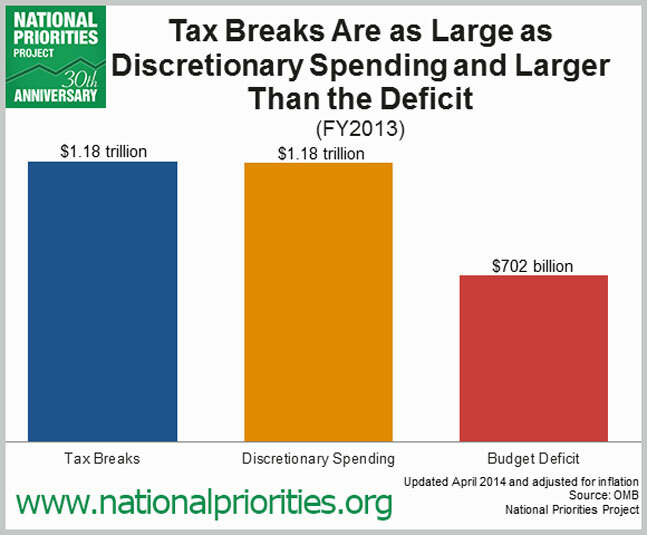 That’s the deficit and it’s only 2/3 what the tax breaks are worth. So, when you get all frantic anxious about how the deficit is ruining the economy like FauxNews keeps telling you, just know that we can fix it in a single year by canceling some – not all, just some – of the tax breaks corporations that don’t actually need them have blackmailed the Congress into. See, easy! Oh, who am I kidding? This will never happen. Case in point, a Republican named David Camp, Chair of the House Ways and Means Committee, and Paul Ryan at the House Budget Committee have both submitted Tax Reform bills intended to “reform” the tax code to varying degrees. What? Republicans reforming the tax code to eliminate corporate tax breaks? Has the world turned upside down? All of them claim to “reform” a discredited cesspool of a tax code, of course, but they have also been submitted in an election year. The GOP, if it knows nothing else (and it doesn’t), knows how to get credit for proposing popular legislation they don’t actually want at a time when there is no chance whatever for it to pass. It doesn’t matter how easy the fix is if the fix is anathema to the Congress’ owners. Barack Obama’s support for corporate trade goals, no matter how unethical and/or borderline illegal, is nothing new. His early and lasting backing of the Panama trade deal – a stellar performance wherein he convinced Democrats to vote for a bill which made it legal for US corporations to violate US law – was a brilliant part of his strategy to move the Democrat party onto Wall Street. So it was no surprise to anyone familiar with his history that he has been appointing hired Wall Street guns – or goons – to write his TransPacific Trade Policy. Nor is it surprising that he has had nothing to say against their “former” companies paying them for writing and negotiating the deal. Do I have to explain what this means? How their companies are basically paying these guys in advance to continue promoting their interests even as they pretend to work for the govt? Or that Obama just about had to be working hand-in-glove with these corporations to come up with these guys’ names in the first place? Or that these payments are a measure of how deeply corrupt our system is now? Rep Darrell Issa (R-CA) is trying to turn the Post Office over to Staples. This is, of course, a half-truth. In fact, Issa has shown himself to be an enemy of all public services, including free parks and libraries. He has consistently advocated the privatization of all govt functions, proposing that even police and military be replaced by private security firms and fire depts be paid for by subscription. So it really isn’t fair for the postal workers’ union to single him out. Still, it’s typical of the Issa wing of the party (the wing which is, after all, in control of the party) to attach an attack on a public union to a bill cutting veterans’ benefits. Sort of a Pub’s Dream Two-fer. This false claim about privatization is being pushed by entrenched special interests who oppose common sense and bipartisan reforms in both House and Senate postal modernization bills. “Special interests” may be accurately considered as a reference to unions since Issa defines “public interest” as anything a corporation wants, but the interesting word here is “false”. Whenever Issa and his people have claimed that some unpleasant fact reported about this peppy little stooge of the powerful was “false”, all the evidence proved it was true, which in turns mean this flat denial likely proves it’s exactly what this is all about. The most obvious question here is: did Staples contribute to Issa’s campaign and if so how much? But Salon’s reporter, Josh Eidelson never asks – let alone answers – that question. Instead he delves deeply into Dianne Feinstein’s husband’s connections to Staples (to no very great effect) because he’s suspicious of La F’s refusal to support the union’s preferred bill (offered by Vermont senator Bernie Sanders), a bill he doesn’t bother to explain. It seems that even “progressives” can’t bring themselves to directly attack extreme corporate puppets like Issa, who has never had a thought a corporation didn’t put in his head. PS I don’t have to explain why privatizing the Post Office is a really bad idea, do I? A lot of well-meaning but thoughtless people have been supporting the modern GOP because they believed, despite all evidence to the contrary, in the right-wing myth of corporate efficiency and competence. What all these people refused to acknowledge was that the reality beneath the appearance of corporate success had far less to do with competence than greed, far less to do with efficiency than ruthlessness. Well they may still be in denial but if they’re paying attention at all they will have realized that we are seeing corporate-style governing this week in the extortion and blackmail the Republican Congress has loosed on the nation in a desperate attempt to get its own way. These are time-honored corporate strategies used by disparate corpos from Disney to IBM to Microsoft to Wal-mart to McDonald’s. Extortion, blackmail, and bribery are the three key components of American corporate success. So it was no surprise when Robert Reich let it slip in his blog that this govt shutdown was planned and paid for by…tah dah!…the corporate BigWigs of th 0.1%. The bullies are a faction inside the Republican Party – extremists who are threatening more reasonable Republicans with primary challenges if they don’t go along. And where are the Tea Party extremists getting their dough? From even bigger bullies – a handful of hugely wealthy Americans who are sinking hundreds of millions of dollars into this extortion racket. Their game plan is to not just to take over the Republican Party. It’s to take over America. These are the standard tactics of a hostile takeover: threats and intimidation. Do what we want or we’ll burn down the store. I’d say the gloves are off. They’re not even pretending anymore.